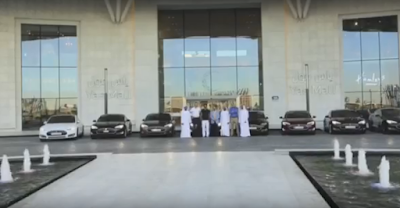 TESLA UPDATES: [Video] Abu Dhabi Tesla owners ask Elon Musk to open a store in U.A.E. [Video] Abu Dhabi Tesla owners ask Elon Musk to open a store in U.A.E. Following recent campaigns by France and Spain to encourage Tesla to build a factory in Europe, and Tesla owners' appeal for Elon Musk to open a store in Portugal, Abu Dhabi owners joined in by making a promotional video to promote their city's adoption of the U.S. automaker's vehicles. Currently, Model S owners in U.A.E have to import their vehicles as Tesla does not have any stores in the Middle East yet. When asked if Tesla will expand to U.A.E. at the International Transport Forum 2016 - in Leipzig, Germany - JB Straubel said "we have to reach a critical mass in every market before we can expand to a new market. We try to take it one step at a time." Dubai has already featured a Model S in its video to promote autonomous transportation in the city, U.A.E. Prince Mohammed bin Rashid Al Maktoum announced the plan back in April, claiming "by 2030, 25 percent of vehicles in Dubai will be autonomous to facilitate people's lives and increase their productivity and preserve our natural resources and our environment." Abu Dhabi played an indirect role in saving Tesla from near bankruptcy back in 2009. During Tesla's annual shareholder's meeting, Elon Musk explicitly thanked Daimler for bailing out the company back in 2009 when it was about to go under. Daimler acquired an equity interest of just under 10% in Tesla Motors Inc. in May of that year then sold 40% of that share to Abu Dhabi's Aabar Investments. This investment allowed Daimler and Aabar to leverage their shared interest in the development of low CO2 drive systems. Last year, Jordanian Manaseer Group installed three Supercharging stations in Irbird, Qatrana and Aqaba. Even though Tesla still does not show those superchargers on their map. Elon Musk did confirm their presence through a tweet last year and announced more to come in the region by this year. More than 100 Tesla vehicles are alleged to be driving in Jordan already.